Graphic novel aficionados rejoice! Now for the first time since its original publication in 1984, the black and white comics from Scott McCloud's classic series Zot! are being reprised in their entirety. This commemorative compilation marks the first time that these comics are being offered together in one volume. In Zot! The Complete Black and White Collection: 1987-1991 (Harper; Trade Paperback Original; On Sale July 22, 2008; $24.95), McCloud not only includes never-seen-before art, but he also provides extensive commentary about his creative process, his evolution as an artist and the state of the comics industry during this incredibly pivotal period. McCloud first created Zot! at the age of 23, when both he and the comics world were poised on the threshold of adulthood. In fact, it was this series and its frenetic and innovative exploration of comics' potential that ultimately helped shape McCloud's views and set the stage for his ground breaking theoretical works, Understanding Comics, Reinventing Comics, and Making Comics. Hailed by Samuel R. Delaney, author of Dark Reflections, as ". . .refreshing, lively, and truly entertaining," this collection of McCloud's stories combines the best ideas from Manga, alternative comics and superheroes and in many ways serves as a formal precursor to the wave of American Manga that was to come. The series follows the adventures of Zachary T. Paleozogt, A.K.A. 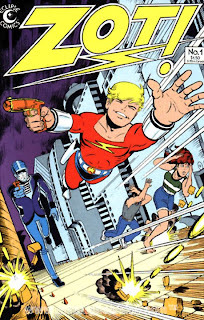 "Zot", who lives in "the far-flung future of 1965," a utopian Earth of world peace, robot butlers and flying cars. When Zot's travels take him to a world of disappointment and broken promises--the Earth we live in--his one consolation is meeting the lovely Jenny Weaver. Stepping across portals to each other's world, Zot's and Jenny's lives are forever changed. Celebrated by comics fans throughout the world, McCloud's books have been published in more than 16 languages. Among his many honors, Scott is the recipient of the Quill Award for Best Graphic Novel in 2007 for Making Comics. The legendary Will Eisner, has called McCloud's work "a landmark dissection and intellectual consideration of comics as a valid medium." In so far as Zot! is the fictional series that made all subsequent McCloud books on comics theory possible, this commemorative edition deserves a special place on every comic collector's bookshelf. Scott McCloud is a widely acclaimed illustrator, and the author of Understanding Comics, Reinventing Comics, and Making Comics. He lives in California.